Wotofo’s first sub-ohm tank, the Wotofo Steam Engine is an innovative new setup with 6ml of e-juice capacity, massive dual adjustable airflow holes and independent juice control to customize juice flow to the coil. 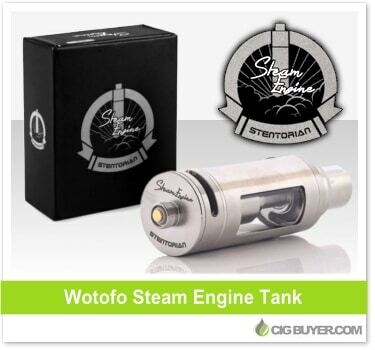 It can be filled from the top or bottom, and the Wotofo Steam Engine Tank can be used with three different high performance coils catered for different types of users: 0.25 ohm parallel coil, 0.7 ohm clapton coil, or 0.25 ohm flat coil – all made with Japanese organic cotton. Wotofo has also implemented a dual layered drip tip to minimize heat transfer at high watts.